1. Using high-quality LED light source, life expectancy of up to 50,000 hours. 2. built-in cooling system. It can solve the heat problem. 2.Ensure that the product is used under normal conditions. The working environment of the lamp is -20~40°C, 45%~95%RH. 3.Avoid installation at the place of heat source, hot steam and corrosive gas so as not to affect the service life. 4.Ensure that the mounting position can withstand 10 times the weight of the product before installation. 5.Please turn off the power when thundering. HUMANIZED DESIGN: vertical placement / hanging display, Let home always be cozy degree. EASY TO OPERATE：just press among 'MOOD', 'ADJ', 'MEMORY' button to switch and adjust the LCD thermometer and hygrometer. Clear and easy to operate. 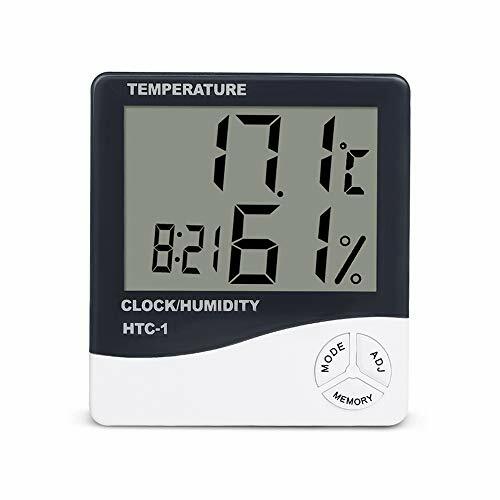 SUIT APPLICATIONS: with humidity and temperature monitoring, the digital room thermometer suits for using at home, office, indoor living room, perfect for baby children use. If you have any questions about this product by KOSCHEAL, contact us by completing and submitting the form below. If you are looking for a specif part number, please include it with your message.